This was the club's first trip to Strathconon, which had already been christened Corbett city by some, with a fair sprinkling of Grahams and the Strathfarrar Munros on offer as well. Everyone managed to find the hut, due to a well placed large yellow crane by Cormac's house, (and no we never did find out what he used it for). When I arrived it was to the news that the heating was not working although the room everyone was sitting in was boiling - proving that the generation of hot air from other sources was more than adequate. As the next day dawned grey and cold with snow falling, numerous plans made the night before were modified rapidly. Rumour had it that the weather would improve later. So 'glass half full' Martin decided to go on a really long walk to make sure he was still out when the sun came out - whereas others though this completely irrational and opted for a shorter day. Well as it turned out, Martin was right. 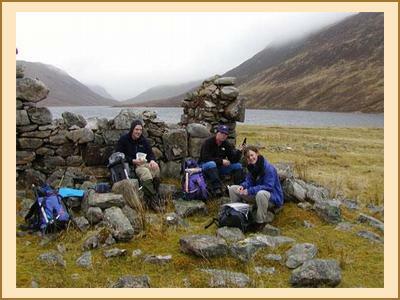 I was in a group of four optimists who aimed for the Strafarrar Munros, setting out in the mist and rain. After a long walk in through some very empty country we trudged up the ridge with frequent navigation stops as the world around us vanished the further up we got. There was plenty of snow on the ridge but it was not that cold and the sun kept threatening to break through. 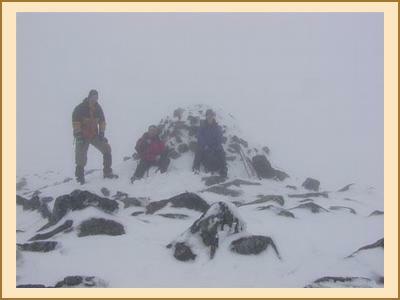 At the third summit the clouds lifted and suddenly we could see and got fantastic views of the ridge. We could also see two little dots (Martin and Richard) who were rapidly catching us up after conquering a distant Graham - and then adding on the Strathfarrar hills just for fun. We got back to the hut to find the pessimists confirmed in their approach by walking in the clag all day. There is some moral to be drawn here. That evening also divided into two camps, the girls who decided to investigate the local ceilidh in the village hall, and the boys who were inevitably drawn into that mysterious 'match of the day' vortex even though the hut TV reception was a bit like the weather earlier in the day. There were 6 of us in the ceilidh group - which was handy really - as that's exactly the right number for the Dashing White Sergeant - although not quite enough to Strip the Willow. We arrived clutching bottles of wine, but were plied with enough tea , cakes and sandwiches to feed an army, by an array of charming young ladies. The music was provided by Frankie, a lone accordionist and the scene resembled more of a local pub than a ceilidh; with the good citizens of Strathconon being clearly more interested in eating and drinking than in dancing. The whole event was watched closely by about 50 deer hung around the walls in the 1930's - each carefully labelled with who and when (but not why ). Subsequently I discovered this had to be taken with a pinch of salt because the last time they took them down for cleaning they got all the labels mixed up. Oh well. The following day dawned considerably fairer but was forecast not to last. I went off down the road with Pat to investigate the local Corbetts, passing by the very posh Strathconan estate house owned by 'Mr Lego'. Like everyone else that day, who all tackled various other local routes, we were rewarded with fabulous views of Torridon and the Fannaichs. It was however very cold and windy in places and Pat and I missed out one top on our route as we were both unable to stand up. The threatened bad weather never really quite happened however and everyone had a pretty good day.